Thursday Moda #27 and Summer Jumpsuits. Happy September Fashionable Beauties!! 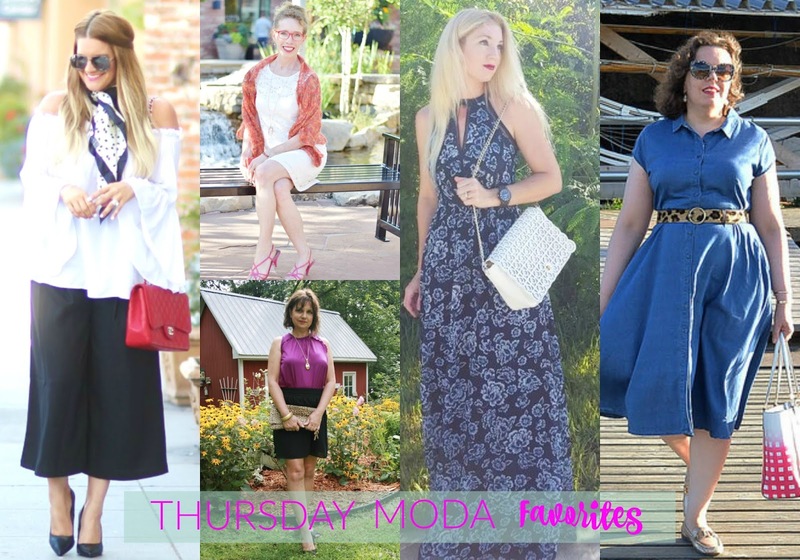 Welcome to the 27th week of Thursday Moda. Today, I am technically entering the 7th month of the linkup so I want to thank you all for making it fun, stylish, fashionable and successful. Speaking of fun, stylish, fashionable and successful so is my co-host and her blog. 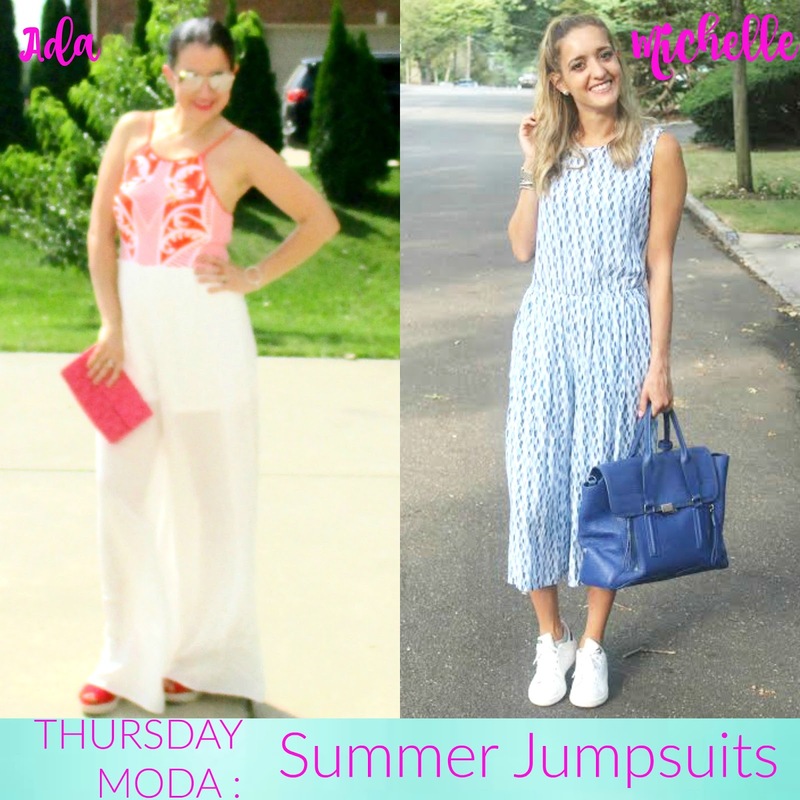 Today, MICHELLE from Michelle's Pa(i)ge is co-hosting with me and we are styling a favorite item for us both: a Jumpsuit. Summer Jumpsuits and Summer Rompers are all the rage, right now. Michelle and I love and own a lot of these. 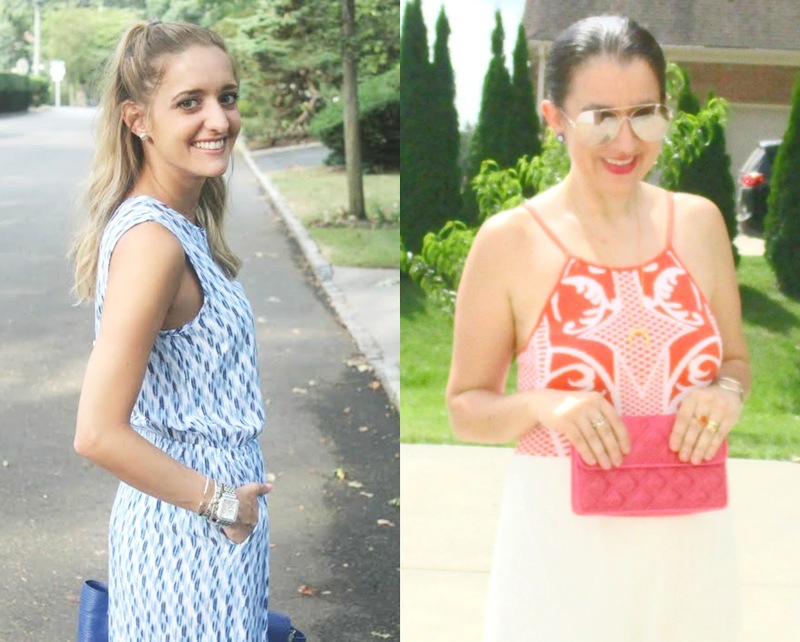 As a matter of fact, exactly a year ago, I co-hosted the then-new linkup (hosted by Michelle) where we styled Rompers. I have also co-hosted her Monday Linkup, once more this Summer. Michelle's Jumpsuit is an adorable Blue+White Summery Print and she paired it with White Sneakers and a Large Blue Tote. I decided to bring out the Coral in my own Jumpsuit and I chose a Coral Clutch, Red Wedge Sandals and Red Lipstick. Make sure you follow Michelle because her style is awesome and I want everything in her closet. Also, link up with her themed "Start the Week off Stylish" linkup, every Monday. This jumpsuit is new to my closet and that is exactly how I would style it for a date with my husband. The jumpsuit was luckily gifted to me from a local Michigan boutique which has the cutest, most unique things. Target.com owns an identical jumpsuit. The brand of mine is "Ever Young". The bottom part is White Gauze Palazzo-Style Pants while the top part is a Knit Material in a Coral+White Mosaic Pattern. I love how the top is fitted and shows off my curves, while the long pants also are flattering on my long legs. While I am only about 5.6"-5.7", I do have very long legs. My Silk Quilted Coral Clutch and the Red+Straw Wedge Sandals were perfect accents to this Gorgeous Jumpsuit. I added the Gold-Tone Crescent Necklace from my recent Rocksbox (which I love) and it paired so nicely with my Gold-Tone Closed Circle Cuff Bracelet. Also, my rings are all gold and one of them has a bright orange stone. My hair was put in a bun and on the back I added a Pastel Peach Large Chiffon Bow. Lastly, I anchored my makeup with Bright Red Lips and was good to go. Also, the coral and white colors of the jumpsuit show off my tan from that beach vacation I had. What do you think? 2-in-1 Palazzo-Style White w/ Coral Mosaic Jumpsuit: c/o Carly's (a Local Boutique) (New) (identical, Steal), (similar, Great Deal), (gorgeous dressy option, love this). Pastel Peach, Oversized Double Bow Hair Clip: Forever 21 (New) (identical, Fantastic Deal), (similar, set of 3, Steal), (similar, I also own this, Great Deal, my Favorite). Coral Quilted Silk Mini Clutch: The Limited (similar, Steal), (similar, on Sale, my Favorite). Red Faux Suede Wedge Sandals w/ Woven Straw Heels: Payless (New) (similar, Steal), (similar, love these), (gorgeous option w/ fringe, my Favorite, Splurge). Today's 6 Featured Ladies are all poised, polished, dressed up and lovely. A lot of office and work-wear inspiration with my favorites this week. I had a hard time narrowing it down to 4 or 5 favorites from the 117 outfits linked up last week so you get an extra one. Today's Featured Blogger is BOGI from Red Reticule whose style I would describe as polished perfection. From her coiffed hair to her perfect makeup, the pretty dresses/skirts she wears and all the classic pumps, this lady has the office style down to a T. She linked up a Gorgeous Mustard+Ketchup Outfit made of an Elegant OTS top and Feminine, Classy, Trumpet Midi Skirt - my favorite of the two outfits. She also linked up a Classic Red Sheath perfect for the office and I love the full sleeves. You know I cannot resist a beautiful red dress. Bogi's blog is very inspirational to me. When I go back to work full-time (one day), I will use her for lots of office inspiration because she is incredibly elegant. Make sure you follow her if you don't already. Her 'Street Chic' style is often done in Black+White but Shauna also looks fab in bright colors. Love the Cropped Culottes with a Girly OTS Top. And that Quilted Red Bag!! Jodie wore a 'White Dress' dressed up with Orange (pretty kimono) and she also linked up another post where she showed the same LWD casually, with a vest. Stephanie loves this Navy Floral Maxi Dress and wears it 'On Repeat' and I cannot blame her. Her Lazer-Cut White Bag and Wooden Jord Watch are stunning. 'Denim and Leopard Print' are two of my favorite things and Tiina elegantly combined the two in a Retro-Looking Outfit featuring a Midi, A-Line Denim Shirtdress with the Perfect Round Buckle Leopard Belt. Amy is a huge fan of JC Penney where she picked up this Pretty Purple Top and she shows how to wear it 'Six Styles' (with another blogger) but I loved it with the Simple Black Pencil Skirt. Today's Thursday Moda Co-Host: Michelle's Pa(i)ge (by Michelle). 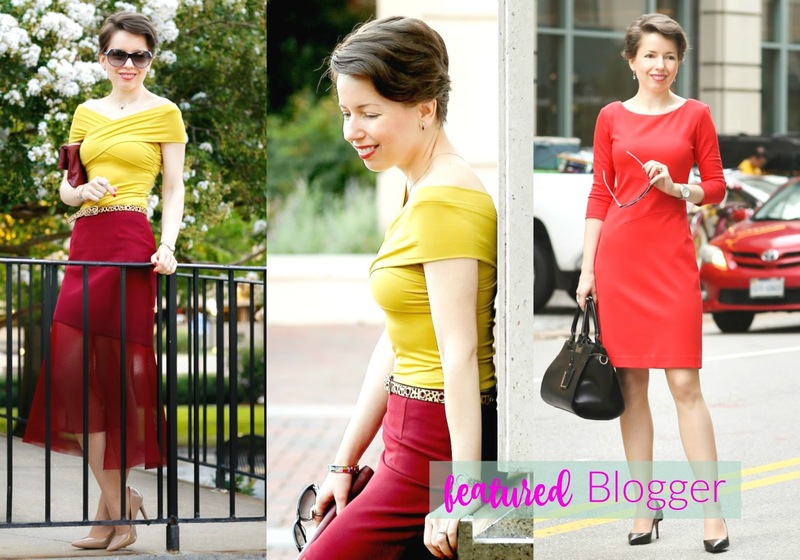 Michelle shows both dressy office looks and casual looks in her blog. Here is a sneak peak of some recent casual outfits of hers which I love.